The other day I surprised my youngest daughter with an ice cream social at the house to celebrate her upcoming birthday. We had to cancel a planned sleepover because of my oldest daughter being sick, but I wanted to do something unexpected and fun, and the gathering was a hit. After all the ice cream and party games were done, I handed out goody bags to all the girls in attendance. They couldn't wait to dump them out on the floor and see what was inside. Besides the basic party favors -- candy, dress up jewelry, stickers, bubbles, etc., I included a Tangle for each girl. Have you seen or heard about the Tangle, the original fidget toy? If not, here is more information about this wonderful therapeutic and educational toy, that kids and adults will enjoy playing with. "Tangle is one of the most highly recommended educational and therapeutic toys, worldwide for an incredibly wide range of Special Needs population. The shape, color, texture and visual impact of Tangle stimulates the brain and makes Tangle a fun and functional toy! Tangles are based on the concept of infinity and continuous motion. This "Magic in the Motion’ that you feel when you play with a Tangle is truly therapeutic and calming to the soul! Once you put a Tangle in your hand, you just can’t put it down! A Tangle is more than just a toy. It is twistable energy that enables a free flow of creativity from your mind. Technically, a Tangle is a series of 90-degree curves, connected and able to pivot at each joint. It has no beginning and no end - just continuous motion! “That fun, twisty thing!” Tangles have endless uses and serve a variety of different purposes. It can be a puzzle, a movable sculpture, a desktop toy, a fidget, a brain tool, an anti-stress device, a teacher supply, or even a cosmic art toy with special powers! The possibilities are limitless! • Tangles are fun to look at, fun to hold, fun to twist, turn, and manipulate. • Tangles are appealing to all ages, to boys and girls alike, and even adults. • Tangles offer a hands-on art experience. • Tangles bring out creativity and artistic imagination! • Tangles are silent and calming. They do not disturb or disrupt others. • Tangles are safe, reusable and affordable. Tangle toys come in a wide array of patterns, colors, and types for different age groups. They make great gifts for the home or office for people of all age groups!" Even though Tangle toys were made for children with special needs, this fidget toy really is a must have for everyone. I ended up picking up a Tangle for myself after trying out the ones the girls had, and found it to be very relaxing. Just the continuous motion of this fidget toy really calms you down, when you are stressed, anxious, or just need to keep your hands busy. I can see this toy being great for the elderly or those with arthritis who need to keep their hands and fingers moving. Once you try out a Tangle for yourself or pick up and share with your child, you will see firsthand the many benefits of this popular fidget toy, and wonder how you ever lived without it. You can learn more about Tangle at zurutangle.com." 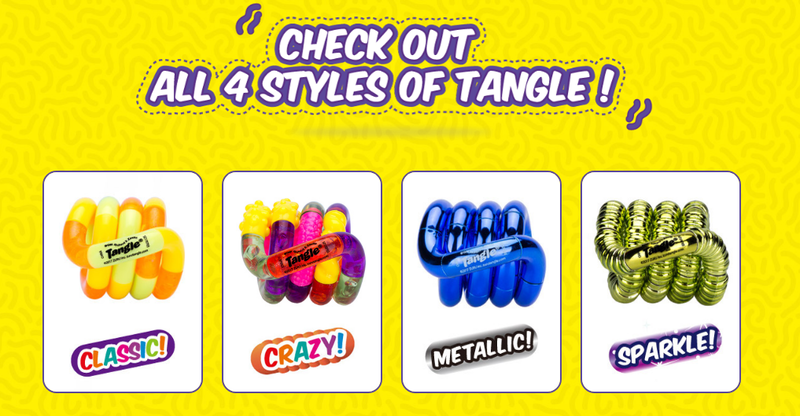 Tangles are available in store at Walmart, online at ToysRUs.com, and cost under $5, so they make for great party favors, stocking stuffers or gift exchanges. OK I read fidget toys and expected something entirely different. You surprised me in a good way! I much prefer this type of toy to the spinning irritaing things out there now. Cute colorful and also fun.